← How do I extract image file from PDF to jpg? Is there a way to perform searching text in PDF for a grammar error pattern? Question:I am in the process of proofing a 250-page document in PDF format. Just in the beginning, I have already noticed several instances where a sentence ends, but there is no space after the period and the capital letter of the next sentence. Is there a way to perform a generic search to find these missing spaces? Is there any good solution on VeryPDF? Answer:According to your needs, I guess you can convert PDF to word then check grammar error in word document. 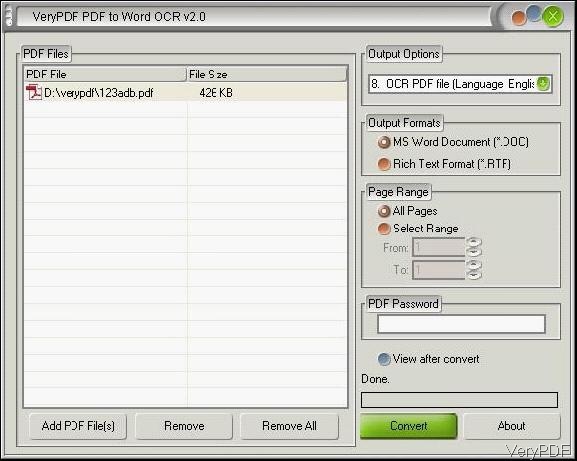 If you do not have MS Word application installed, you can use software VeryPDF OCR to Any Converter, which allows you to extract content in PDF to text then check spelling. But this function is only limited in English. 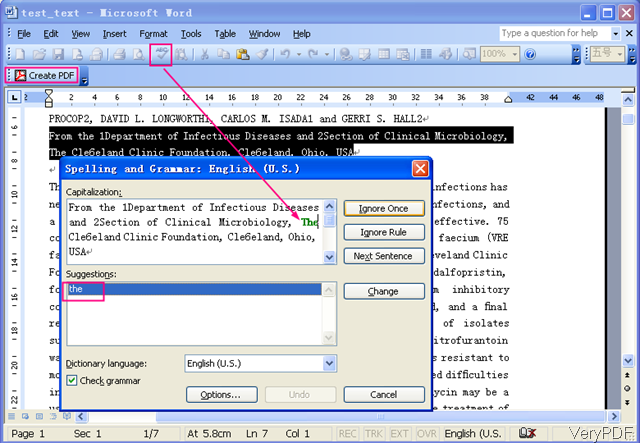 In the following part, I will show you how to check grammar error when you have MS Word application installed. 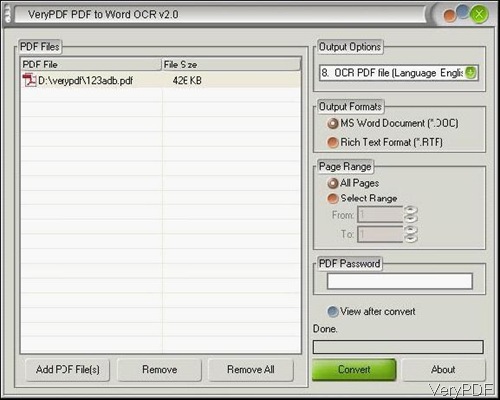 Download PDF to Word OCR Converter. This software can help you either convert image PDF or text PDF to editable word. In the word documents you can check spelling. If you need to know more function of this software, please visit homepage of this software. When downloading finishes, there will be an exe file in downloading folder. Please install this software by double clicking the exe and following installation message. Once installation finishes, there will be an icon on the desktop. Simply click the icon then you can launch this software. Then following snapshot is from the software interface. Please drag PDF file from its containing folder to software interface, or you can browse folders then add PDF file to software interface. In the Output Options part, please choose proper option according to your PDF content. Say if your PDF is image PDF with English content, please choose 8th option. If it is text based PDF, simply use the first option. In the Output Format, please choose Doc. If you need to choose PDF page range, please choose Select Range and then input the range. If the PDF is protected by open password, please input password in the left part. Then click button Convert, the conversion will be launched at once. Open Word document then use word checking spelling function to check spelling mistake. For those who do not have experience in this, I share my experience here. Please open Word document in MS Word application then click option ABC. By this way, the checking spelling work will be launched. This step can be interpreted by the following snapshot. If you have virtual printer install like VeryPDF PDFcamp, when you finish correcting, simply click Create PDF, then it will be converted back to PDF file format. 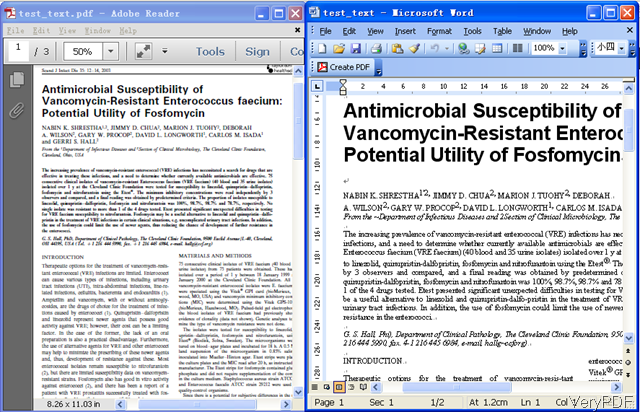 By this way, we can check spelling mistake in PDF on the condition of MS Word installed. During the using, if you have any question, please contact us as soon as possible. This entry was posted in PDF to Word OCR Converter and tagged PDF to Word. Bookmark the permalink.